At 49 feet, 3 inches tall and 26 feet, 7 inches in diameter the Easter egg located in Brazil has been named the worlds largest Easter egg by Guinness World Records. 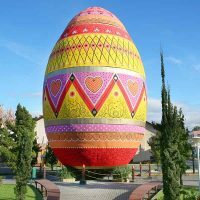 The project was organized by local group, Accociacao Visite Pomerode with hopes to sign the spot light on the Osterfest festival which takes place in Pomerode, Brazil where the egg is located. This larger than life egg was also designed to pay tribute to local artist, Silvana Pujol whose work became a local and abroad icon of eggshell painting.